Action from the last Posh v Norwich game. 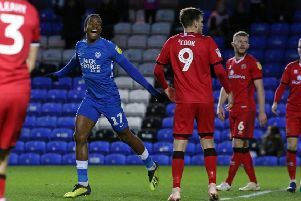 The Peterborough Telegraph has teamed up with Checkatrade, official title sponsor of the Checkatrade Trophy, to offer 15 lucky fans the chance to win a pair of tickets for the Peterborough United v Norwich City tie on Tuesday August 30. Alex Neil brings his Canaries’ to the ABAX Stadium for the first game of the Checkatrade Trophy. Grant McCann will be looking for a solid home win against the Championship side to start this year’s campaign positively in a competition where the club has had success in previous years. Who is the manager of Norwich City? Email your answers to mattpeden@hatchpr.co.uk before 3pm on Thursday August 25 with your full name, address and contact telephone number with the subject line Peterborough v Norwich Competition. Fifteen winners who answer correctly will be picked out at random. Over 1.2 million consumers visit the Checkatrade.com website every month looking for recommended tradespeople local to them. If you need a tradesperson, search by your location on www.checkatrade.com . We have over 2.5 million reviews ensuring you get the right person for your job. The competition closes at 3pm on Thursday 25th August 2016.